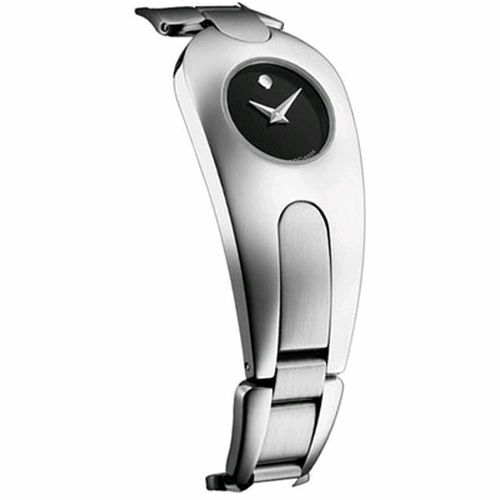 Talk about a futuristic design from Movado and you cant’ help but look at the Timema Women’s timepiece. This luxury Swiss watchmaker has really colored outside the lines, with this creation. It is a tantalizing display of symmetry and style. The 605355 Timema Women’s watch is unlike any other Movado conception. Its contemporary and dramatic architecture is an exceptional modernistic interpretation. This women’s timepiece has the classis Museum dial, but that is where the similarities to any other Movado end. The Timema features a case that is ergonomic and elongated, crafted of polished stainless-steel. The case is oversized, and houses the demure black Museum dial. The bracelet of the Timema is a blending of brushed and polished stainless-steel, and is fastened, securely with a jewelers clasp. This is a battery operated Swiss Quartz movement, and is water resistant to 30 meters. Trust me, you’ve never seen anything like this Movado Timema. The styling of this women’s timepiece will make heads turn, and gives us a glimpse into the artistically creative side of Movado. They have received over 200 awards internationally for design and innovation, and now you see why. Always pushing the envelop, with unanticipated elements, that’s Movado. See the Timema Women’s Watch at the Movado website.